I had so much fun playing with the The Rubber Cafe Creative Cafe Kit called Follow Your Dreams! I used the Birds of a Feather set again...this time I created my own background paper by randomly stamping the solid feathers stamped in Versafine Black Ink onto the pink designer paper found in the BoBunny paper pad included in the kit. Once I was done stamping the feathers, I ran the paper through my Xyron machine and applied You're So Fine Diamond Clear Cool Highlight Glitter. After a quick burnishing with my fingers, this card SHINES! The card base is black cardstock from my stash measuring 4 1/4 x 5 1/2 inches. 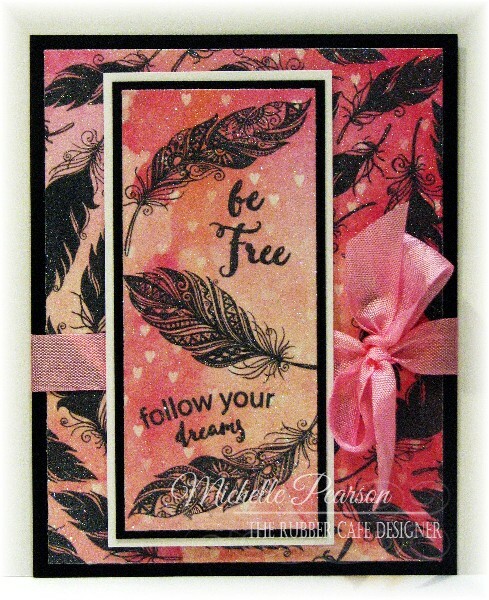 The pink designer paper measures 4 x 5 1/4 inches. After attaching these two layers, I tied a bow with the pink ribbon in the kit before attaching the card base to an A2 folded white card. The white layer measures 2 1/4 x 4 3/4 inches. The black mat measures 2 1/8 x 4 5/8 inches. 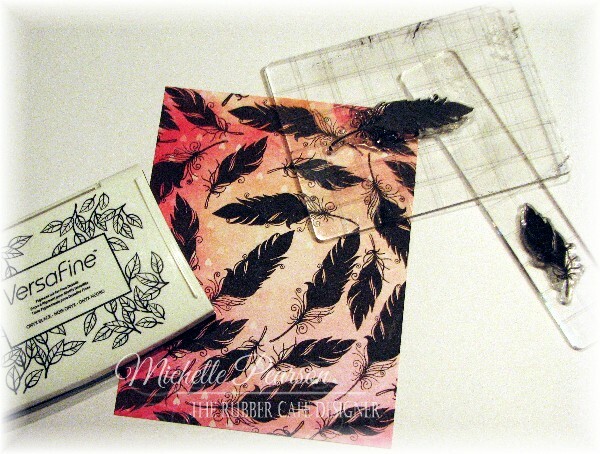 The designer paper layer measures 4 3/8 x 2 inches. 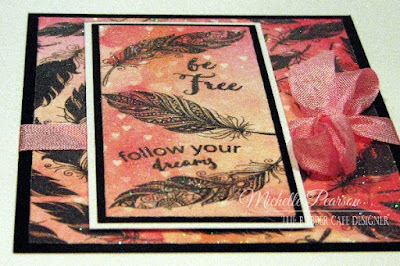 I stamped this panel as shown and then ran it through the Xyron machine and applied glitter. The white panel is popped up on foam tape over the ribbon.